Monday, October 31st, 2016 - Categories: Team. Kaela is a ten year old Club Team climber who has been climbing since 2012. Since then, she has developed a preference for bouldering. Not only does she like bouldering during class, but she spends some of her free time in the gym bouldering with her dad Josh. Recently, Kaela has begun attending local competitions in both bouldering and sport climbing. 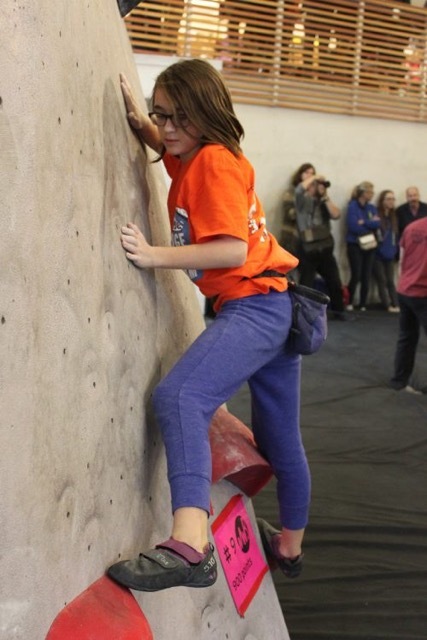 She has her eye on the goal of competing in the Regional Bouldering Competition this December! In addition to climbing, Kaela likes to dance and play video games, loves the smell of her Mom’s brownies, has a brother Liam who also loves to climb, and wants to be an artist or a gamer when she grows up. Say hi to Kaela next time you see her in the gym!